Sherlock's greatest untold tale, as referenced in the canon, finds life in this 1976 Warner paperback. 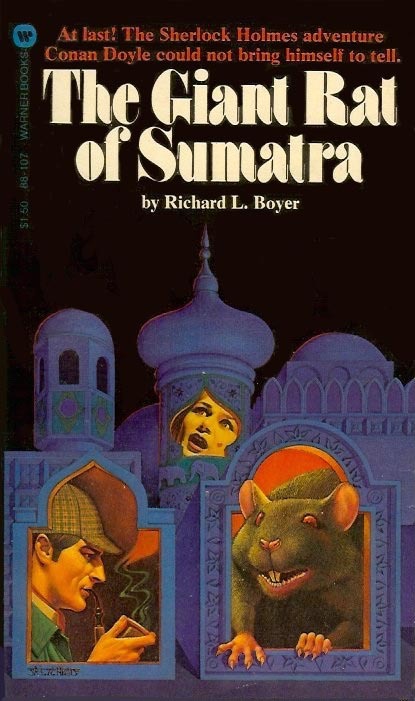 "A story for which the world is not yet prepared..."
That is how Sherlock Holmes described the fantastic tale of THE GIANT RAT OF SUMATRA in his "The Adventures of the Sussex Vampire." Dr. John Watson, in deference to Holmes' wishes, kept the chronicle a secret, stipulating in his will that only in the year 1976 could the particulars of the case be revealed. Here it is! A tale that bears the mark of Holmes' deductive genius, Watson's faithful reporting and a plotting virtuosity that Sir Arthur Conan Doyle himself would have approved in the author, Richard L. Boyer.